Are you looking for a particular book and you can’t find it at any of our libraries? Don’t give up hope just yet! PBCLS offers an Interlibrary Loan service to our members – FOR FREE! Keep reading to find out how to use this fabulous service. Libraries that provide ILL services can ask other participating library systems to lend materials to their library card holders. When we place an ILL request, the request could be filled by any library in the world that is participating in the ILL service. This means that the item could take several weeks to arrive at your branch. The upside is that this service is usually free, depending on the options of each participating library and the materials requested. Look under the ‘Services’ tab on the menu bar at the top right of the screen and select ‘Interlibrary Loan’. 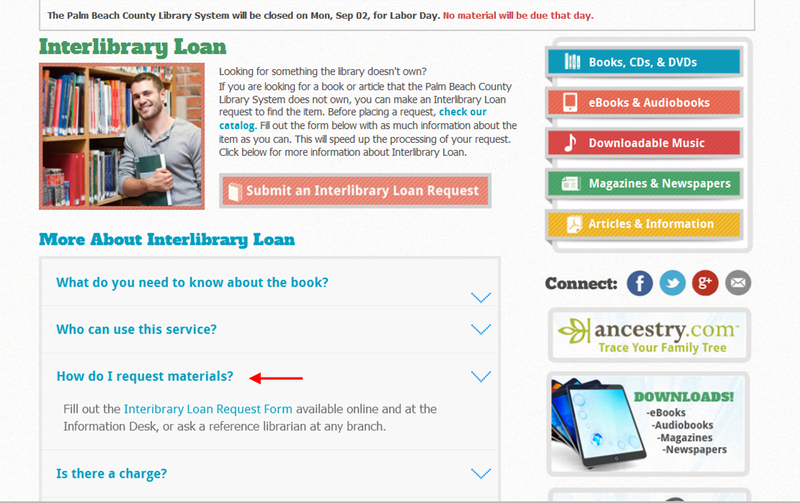 Scroll down the page to the third question/drop down menu “How do I request materials?” The drop down menu will direct you to the ‘Interlibrary Loan Request Form’, which will open in a pop-up frame inside the current window. Fill out the form (you will need your library card number and a valid email address). Once you hit submit, you will receive an email confirming that the ILL request was received by the system. You will receive another email in the coming weeks letting you know the item is being held at your pick-up location or that the request could not be filled. 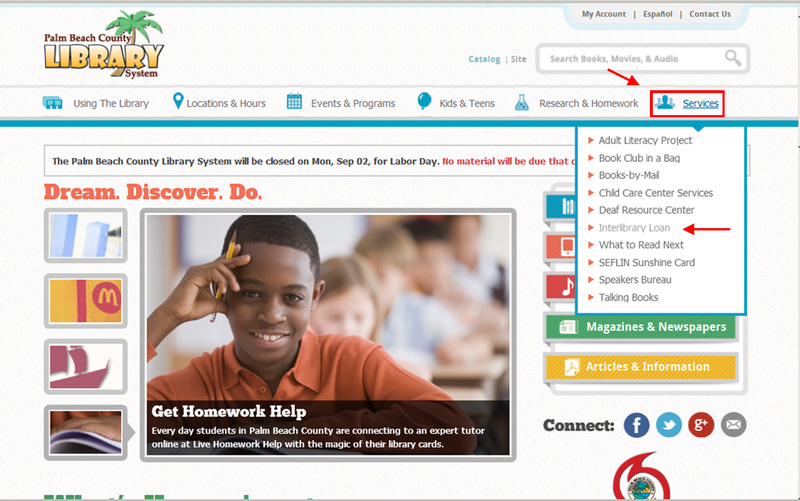 The Palm Beach County Library System is a member of OCLC (Online Computer Library Center) which provides access to millions of item records from libraries around the world. It’s best to check the availability of items on the OCLC webpage at Worldcat.org. If you see the item in the OCLC catalog, there’s a good chance we’ll be able to get it for you. Be sure to copy the title, author, and other pertinent information needed to complete your request.